GENERAL DESCRIPTION: See the creative process in action! 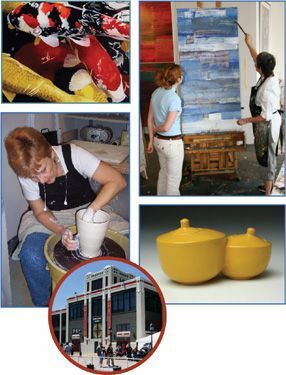 Artists create, display, and sell original artwork, including sculpture, painting, jewelry, stained glass, weaving, hand-pulled prints, ceramics, enameling, and photography in 82 studios. Six galleries feature monthly exhibits by regional artists. Target Gallery features revolving exhibitions from national and international artists. A former torpedo factory, this world-renowned art center is located just outside of Washington, D.C., on the waterfront in Old Town Alexandria, VA. Check our website for free events every month. DIRECTIONS: Metro: Take the Blue or Yellow line to King Street station. Take a free trolley, hop in a taxi, or take a 30 min. walk down King St.
From D.C. or Arlington, Virginia area: Cross the river to G.W. Parkway, go south past Reagan National Airport to Alexandria. Turn left on Queen Street to the river (end of street); Turn right. 1.5 blocks to the Torpedo Factory Art Center on the left. Find out where to park. Take I-95 North which becomes part of the I-495 Capital Beltway towards Baltimore. Merge onto US-1 N via EXIT 177B toward ALEXANDRIA / MT VERNON HWY / OLD TOWN ALEXANDRIA. Go 6 blocks, turn right on King Street to the river and turn left on Union Street (last street before the river); 1/2 block to the Torpedo Factory Art Center on the right. PARKING: 1 designated accessible parking spaces, located 100 feet from main entrance by walkway to rear entrance. Accessible parking space 10 ft. wide. Accessible aisle 10 ft. wide. Nearby ramps well marked. Persons with proper handicapped identification on their cars may park free at any street meter and are exempt from residential parking sticker requirements. 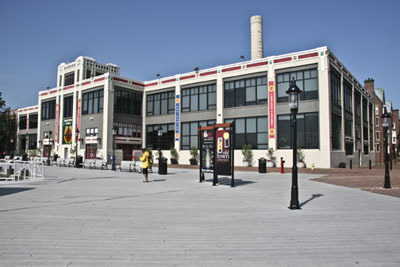 There are also several garages within moderate distance of the Torpedo Factory Art Center, many with accessible spaces. Link to real-time maps to locate parking in garages at the ParkMe website. Link to iPhone app for real time maps to locate parking in garages. TYPES OF PATHS TO OR AROUND ATTRACTION: Brick. Paths accessible to persons with mobility disabilities. Steep grades may require assistance for persons in wheelchairs. Length of paths 80 ft. ENTRANCE: Located 105 North Union Street. Exterior steps, each 8-in. high. Handrails on right. Accessible entrance on the Potomac Riverfront side of the building, facing the marina. Automatic doors 60_in. wide. PUBLIC REST ROOMS: Located on all 3 levels . Available without steps. Doors 30 in. wide, open in. No turns to enter. Wheelchair accessible stalls: 40-in. wide doors opening in and handrails. 19 in. toilet seat height, 18 in. between commode and wall. Sink height 30 in. Wrapped pipes. Accessible stall checked regularly for obstructions. Rest rooms identified by raised figures with pants or skirt on the door to designate men or women. ELEVATOR: Located at the rear lobby. Serves all levels. Door width 60 in. Control buttons 30-35 in. high. Elevator car interior is 72 in. by 120 in. Buttons in Braille and raised. Door stays open 8 seconds. Audible floor change signal. GIFT SHOP: Aisles 30 in. wide. Counters 30 in. high. Aisles clear of temporary displays.